Celebrating ‘Womanhood’ which is a feeling of gratitude for each and every woman in her entire lifetime; be it professional or personal life; in which she remains always busy with her multiple roles offered by life. Be it a mother, a daughter, a wife, a sister or much more. International Woman’s Day is celebrated every year of 8th of March which commemorates the movement for women’s rights and is observed around the world to celebrate the valour of women. Cute Box salutes their continuous struggles throughout the decades for establishing PEACE, JUSTICE, EQUALITY and DEVELOPMENT. ox printed on the top. I appreciate the little thought devoted upon the environment but I feel I miss those old plastic boxes as they can be re-used. What are your thoughts about it? Inside the cardboard box, every jewellery item has been properly wrapped individually. Plus, the jewellery pieces have been kept inside small net pouches. And on the top is a layer of bubble-wrapping paper which helps the content from not getting damaged. The neckpiece that I got has purple thread/woollen material instead of a conventional chain neckpiece. For the closure, one end encompasses a loop while the other has a knot which sits perfectly around the neck. 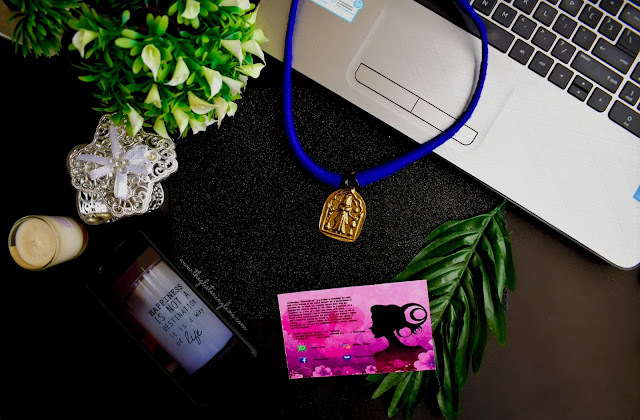 The golden adornment pendant gives a completely ethnic vibes to the necklace. 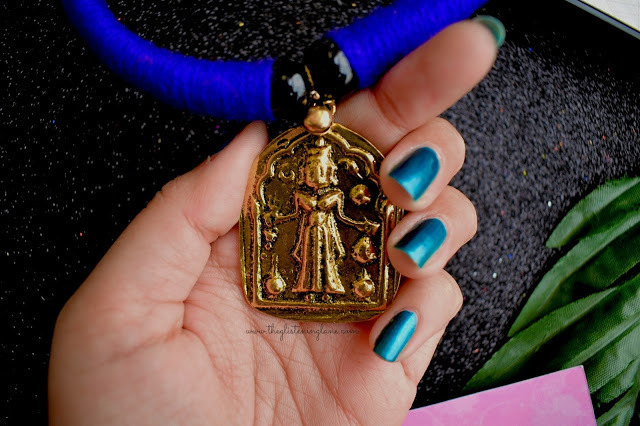 The pendant has an engraved image of a woman and her various facets which she demonstrates in relationships she has with people around her. Personally, to me the image speaks about a multi-tasking woman who can go bold in one instance and shy in the other. I guess it can be paired well with plain kurtis or sarees. The first piece of jewellery that has always lured me to add it into my vanity has to be an earring. 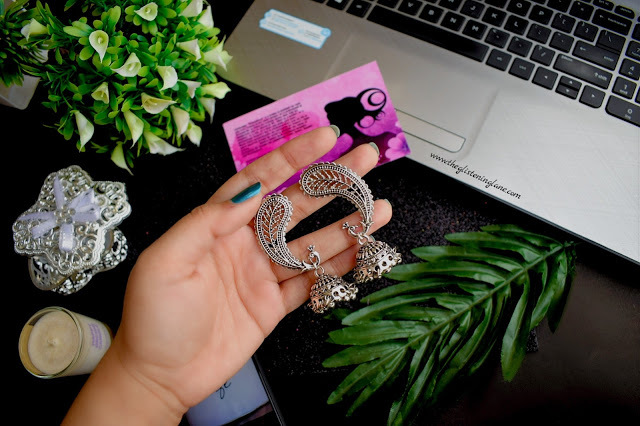 The earring number one that I received in Cute Box March 2018 edition is silver earring with an intricate peacock design on the top and a dangling jumki as the length extends. The quality looks pretty amazing and it does not feel flimsy at all. I believe it would go amazingly well with probably indo-fusion outfits. Golden earrings don’t work well with my skin tone and I’m glad I received a silver variant. Also, I believe some of the other people received a western designs and quirky hoop earrings. Chances are that we might not be receiving the same piece of earrings. Now, this is the first time I’ve heard the terminology ‘wrist chain’. I mean we’ve have had bracelets and chains but a wrist chain would be a new concept for me. This one is so dainty that I love how it looks on the wrist. I can see myself pairing it up with formal as well as informal outfits. 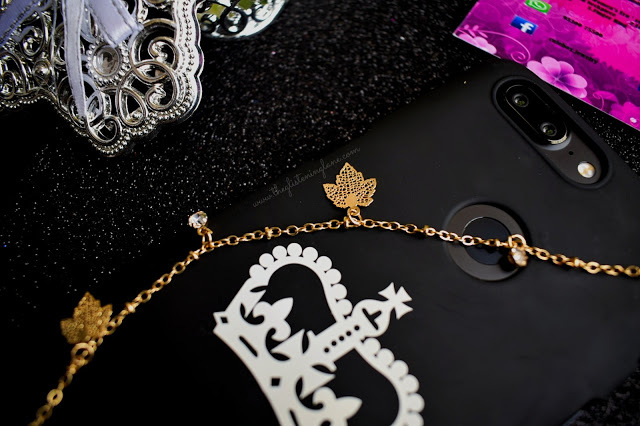 There are few leaf and stud charms attached and I can’t shy away from saying that I love it! Although, one drawback is that its sleekness might lead to a lot of tangles if it is not kept properly. 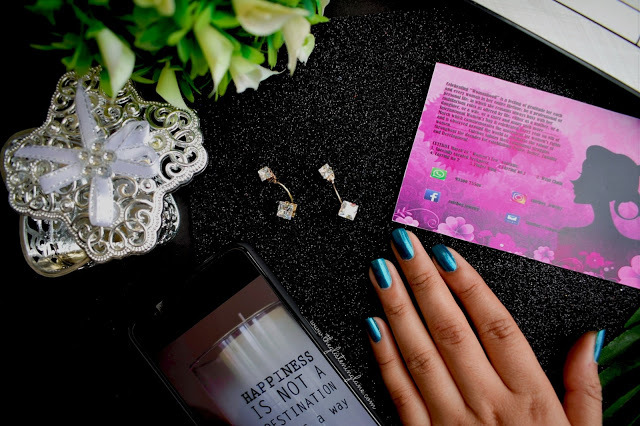 The second pair of earrings that I got is immensely beautiful again owing to their stud quality, shine and innovative design. This type of earring have been trending lately wherein one part is a simple stud and the plug sort of the thing which goes behind the ear has a fancy design which peeks out when you put them together. That way, you can wear a single pair of earrings two-way. Again these can be paired with almost everything and anything, be it your dresses or denim and whatever you like. You should probably refer to the picture for a better understanding of how these earrings are. 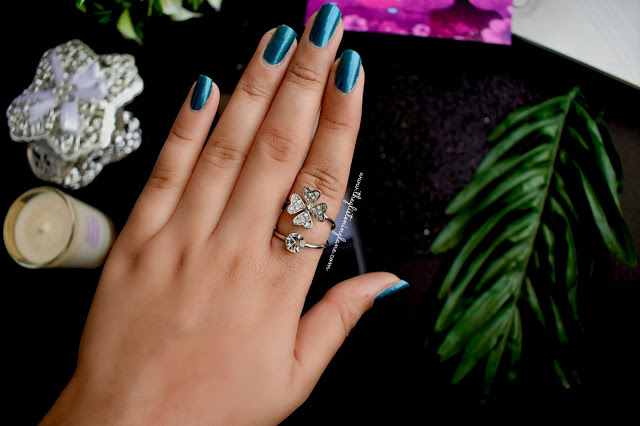 This ring was the first thing which I tried out in real and flaunted it over Instagram, as soon as I received it. The design is pretty amazing, you feel as if two rings have been intentionally stacked together to give that charming appeal. 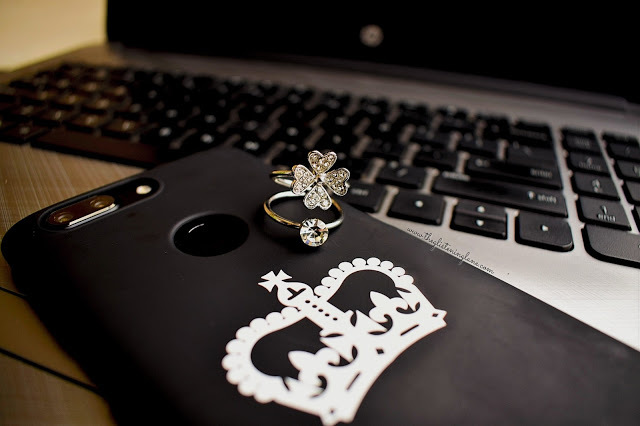 The main attraction of the ring is a studded flower in the centre. It is adjustable and you can loosen or tighten it as per the requirement. 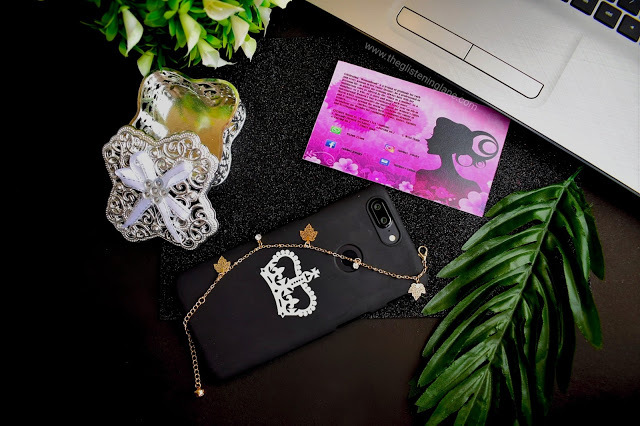 PLEASE NOTE: New Tri-Monthly subscribers will receive 1 bonus gift; either jewellery or an accessory within their first month of Cute Box subscription. Whereas the half-yearly subscribers will get 2 surprise gifts in their first month of subscription.